A few weeks ago, I shared that for the longest time, I had this terrible yellow bathroom and I always had trouble decorating it. Although I wouldn’t say that it’s entirely where I want it to be, installing wainscoting added a classic style and broke up the space in to make it feel elegant. 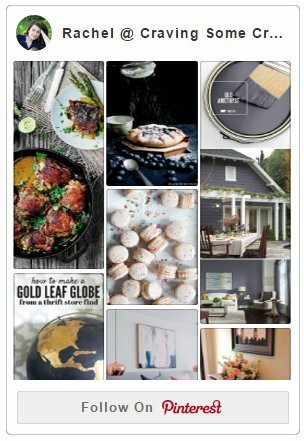 I went with a wainscoting style that fits with my home and included a design that makes use of the existing wall rather than raising the entire panels. 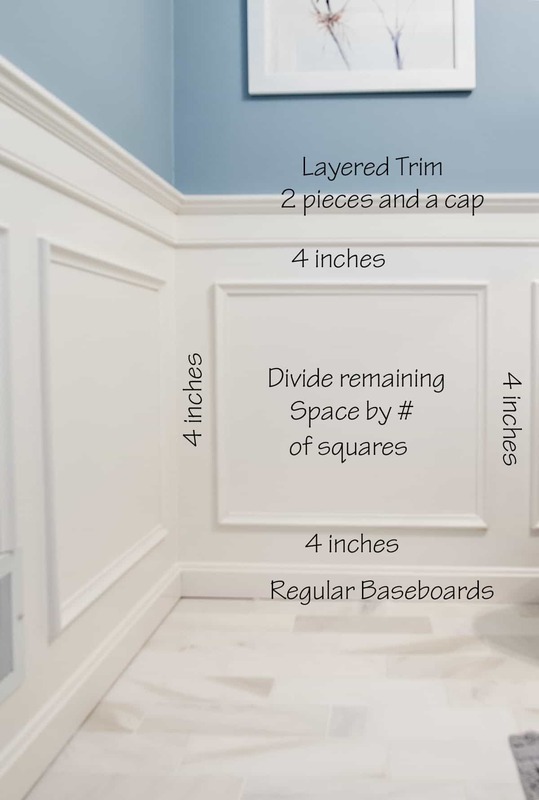 Installing wainscoting this way is much more budget friendly but still beautiful. 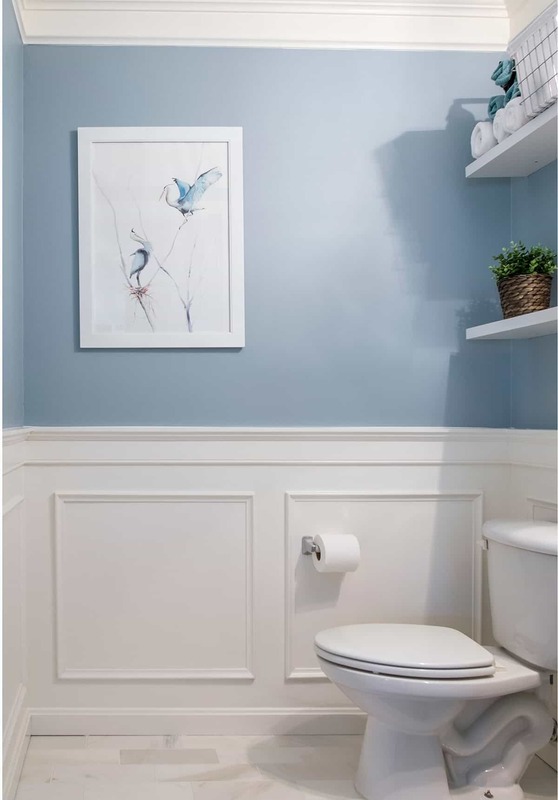 For this or any type of wainscoting design, draw your design before you purchase materials. This will help you visually see how everything will look. You can adjust the height as needed and the sizing. This will also help you see anything that may interrupt your design such as wall vents, a sink, a doorway. For our bathroom, we had to work around the sink and a wall vent but we did not change the size of the squares and it looks fine. Check the corners of your squares with a T-square or vertical level for perfect 90 degrees. And of course, measure twice before purchasing your materials! Quick Tip: Use painters tape while you are still deciding on the design. That way you only have to mark once. I still recommend drawing out the squares once you have decided the sizing. Now that the design is drawn out and measured, the pieces should come together pretty quick, albeit it is a lot of cutting. For this project, a saw like this one is essential, but it is not hard to use. If you are the market for a saw, get a sliding one for larger boards. Everything is a 45 degree angle. 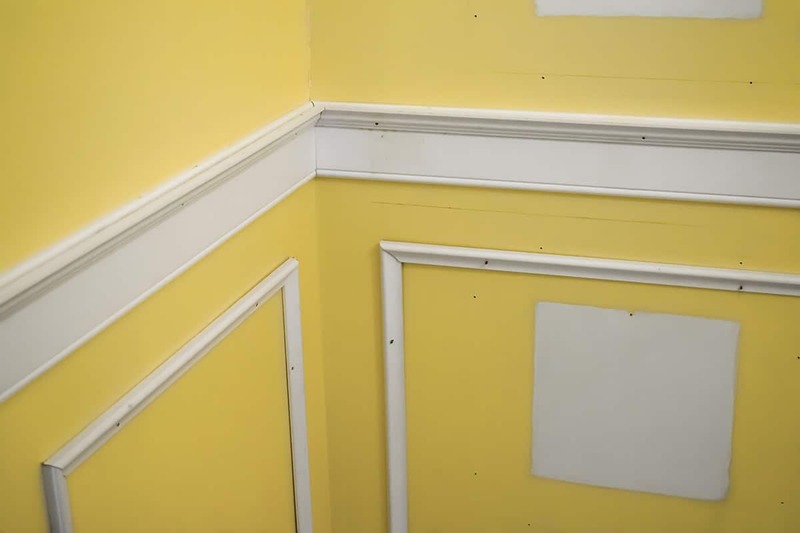 If you are layering trim pieces like we did for the chair rail, you can either put the back piece on the wall and then measure again or build them before cutting. Fill in any nail holes as needed. Although nails and a hammer will work for this project, I highly recommend a brad nailer. It’s fast and requires a lot less hole filling. Fill any nail holes as necessary, but gluing will cut down on how many nails you need. Quick tip: Make sure to label your cut pieces as you go so you aren’t searching for where they belong when tacking them to the wall. Here’s the thing though…your walls aren’t perfectly flat. Even brand new ones. Taping, mudding, and patching create imperceptible bumps in walls. Therefore, you may notice that not all of the wood pieces lay perfectly flat against the wall. That’s ok! To get professional looking results, use a thin bead of caulk around every edge that touches the wall. Make sure to use paintable, interior caulk. 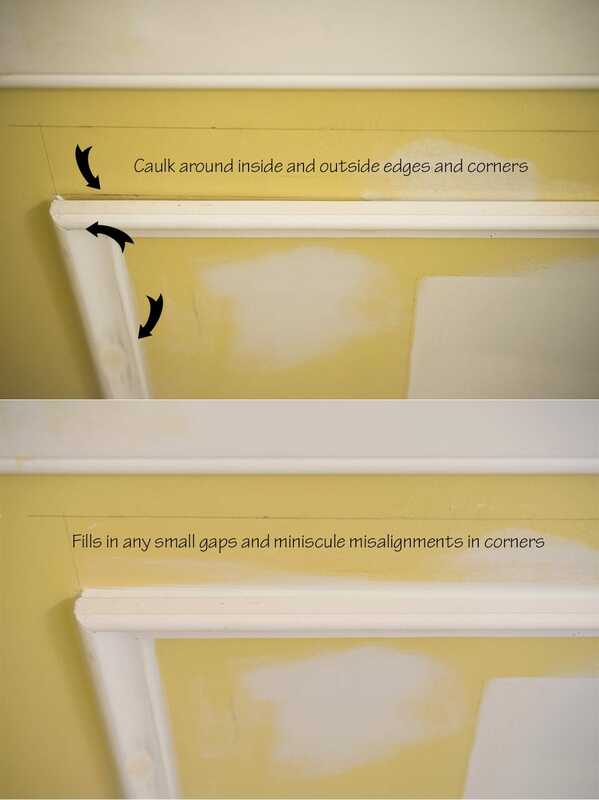 For more tips on the best way to caulk, I repaired and caulked the baseboards last year. Caulking can be a bit of an art. 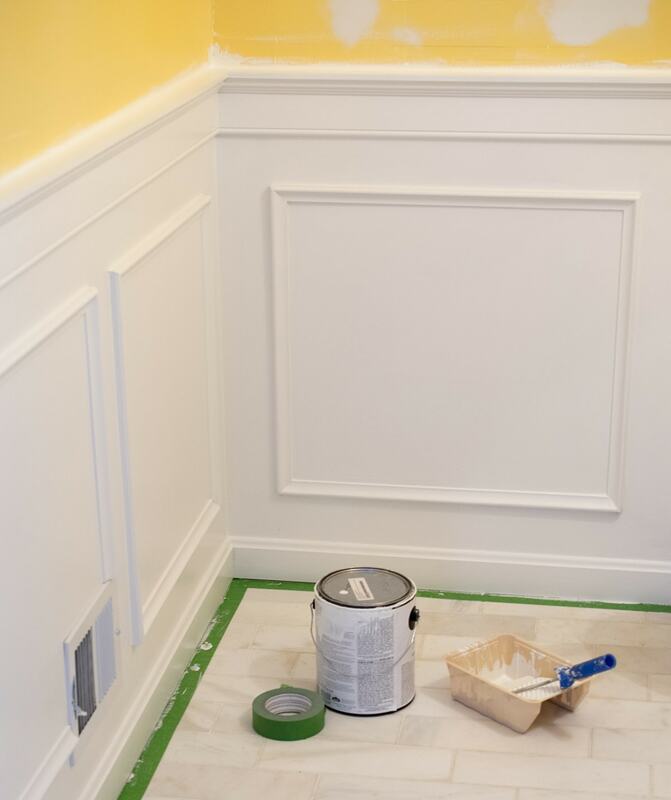 Installing wainscoting is a tedious process, but it gives a look that you really can’t reproduce any other way. In total, we spent just under $200 on all of the wainscoting and supplies, which includes the crown molding we added to the top as well. It has been lovely not to have those horrid yellow walls smacking me in the face and the lighting color is so much better than it was before. We just started our new carpentry services and found this article. Really appreciate you taking the time to give us instructions on how to install wainscoting. It’s a very good DIY guide. wainscoting is an interesting topic to discuss, and you did an excellent job of keeping it entertaining. Thanks a lot!